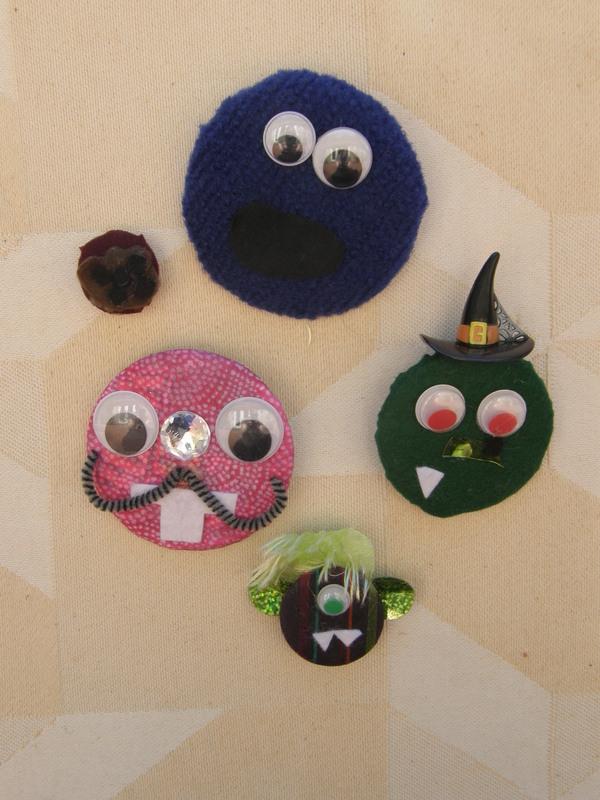 We started making monster pins using a recycled pin method we found in Recycled Crafts. But this method was a bit complicated for kids. So we ended up trying a few other things. 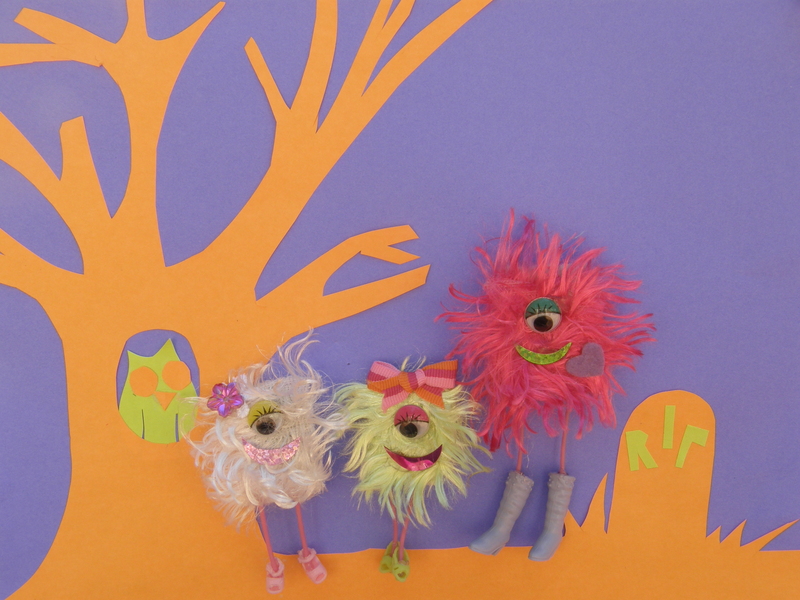 Here are the directions for the much easier to make Glamourous Monster pins above. 1. Cut a square of fake fur. 2. Glue to button pin. 3. Cut a crescent from the bottom of a large sequin. 4. Glue to pin as monster’s mouth. 5. Glue on wiggly eye. 6. Cut rubber cording for legs. 7. Add dot of glue to bottom of cording and stick into small shoe. Repeat. 8. Glue legs to back side bottom edge of fake fur. 9. Cut a small piece of felt and place it over glue and legs to secure. 10. Glue on trim like ribbon for decoration. Tip: If you run out of button pins, you can use a piece of stiff felt for back and glue on pinback. These Pins were made by covering large recycled button pins with Modge Podge, placing fabric over button, then coating with Modge Podge again. Details were glued on when Modge Podge was drying. Hot Glue had to be used to secure buttons with heavy felt (like Cookie Monster). These were harder to make, but we still had fun making them. 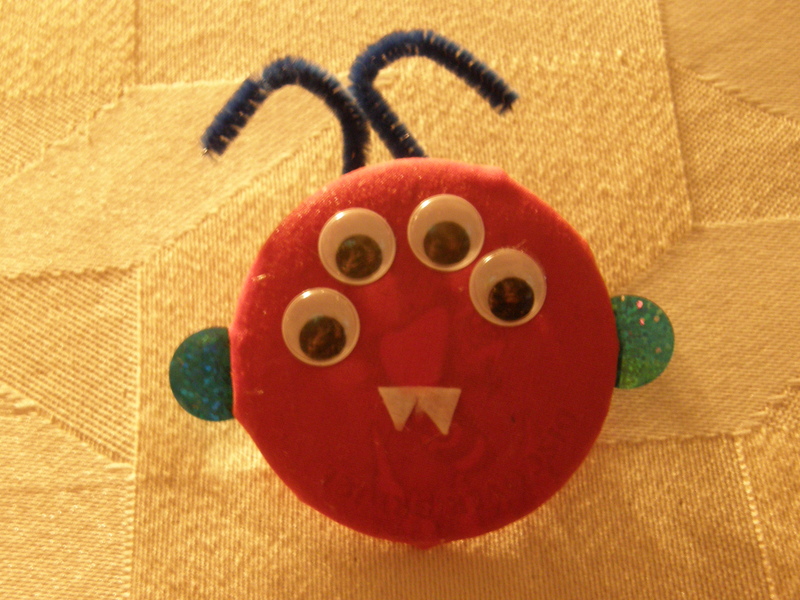 This monster was made using the modge podge method.This pin was made by coiling a pipe cleaner and gluing it to a button pin.